Whether you’re racing around the water on a speedy Four Winns SS or enjoying a leisurely cruise on a double decker pontoon, there are a few tips and tricks you should always employ to ensure you’re making the most of your time out there. 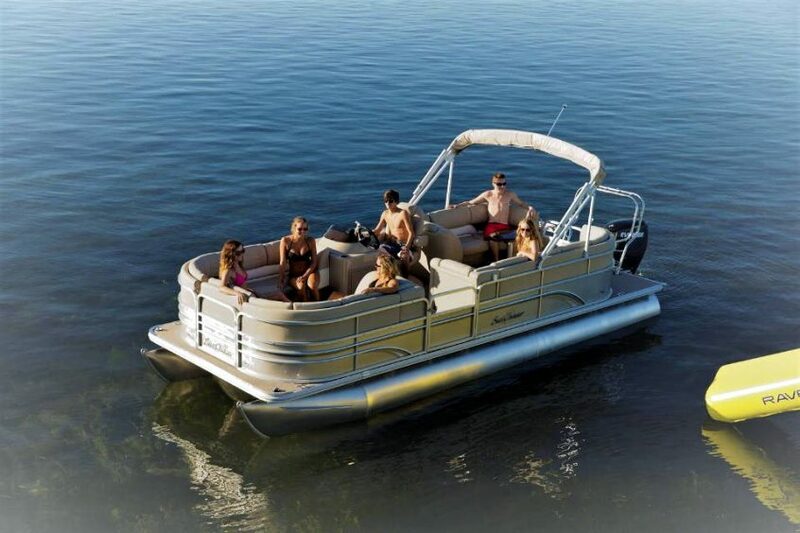 Floating around the Okanagan is a brilliant way to spend a morning, afternoon or even a few days with your mates – follow these tips to maximize your good times on the water! And we don’t mean as a fashion statement, but seriously to protect your eyes. On a sunny day, the sunlight hits your eyes off the water (and straight from the sky) and is exceedingly bright – you’ll not only be more comfortable, but also less likely to get a headache. Sunglasses are also great for keeping the wind or off your eyes and drying them out, and to avoid splashing water in the eye. Protecting your eyes from UV rays helps avoid potential complications from UV, such as cataracts and certain eye cancers. The water can act like a giant mirror, so don a pair and keep your eyes UV-free! Or enjoy relaxing, tranquil classics. The point is this: good music makes coasting around the water so much more enjoyable. It makes you feel alive and keeps everyone in a great mood. If there are lots of people around, rein in the volume a bit; if you’re all alone, let it rip and have a proper party with nature. It’ll also get people dancing, providing great footage for the GoPro home-movie afterwards! If you haven’t spent a lot of time on the water before, you might not know this: you burn a lot more easily in water. Nothing dampens your day (ironically enough!) like sunburn, and on a boat you get the sunshine off the water as well as out the sky, so you need plenty of cream to avoid it. The sun’s rays also jump up off the water to hit your neck, which you often don’t think about. Of course, make sure it isn’t going to wash off as soon as you go for a dip- invest in the waterproof stuff! You might not need our advice on this one, but bringing a good variety of food and drinks is essential for a proper boat trip! Whether you’re sitting 100 yards from the shore or going on a long trip, you need supplies. Make sure you’ve got a cooler (because nothing beats a cold drink in the sun) and don’t forget your cutlery! Of course, dropping by one of the water-accessible restaurants is a great idea, too- just remember that a picnic will cost a lot less than marine-side dining. This is a biggy. Obviously you want a day of sunshine, but if you’re sailing it’s worth checking what the wind is doing, where the clouds are coming from and what time this is all going to happen. The weather can really alter your plans, but if you know what’s coming, then you can still have a great day out. There’s no way you’re taking on a good boat and not taking her for a spin! To get the most out of your mileage (and to make sure you return her on time!) it’s always smart to make a rough plan of where you want to go. You don’t need coordinates and a series of maps, but a vague sense of purpose will definitely help make the trip more enjoyable – and less stressful! Sometimes all the planning in the world is worth not enough if the weather changes its mind; make sure to bring a small bag with a pair of trousers and a dry top layer (okay, maybe a pair of socks, too). There’s nothing worse than getting out the water and the sun disappearing before you’ve have a chance to dry up, and you don’t want to get cold. Fingers crossed you don’t need to wear them at all! Having a day (or a few days…) out on the water is the best possible way to pass time in the summer. We hope you have a great time out there and that these tips come in handy! I really appreciate your advice to wear sunglasses and waterproof sunscreen when we go boating. My husband and I are looking into renting a double-decker boat for our family reunion. It would be great to be prepared for any glare off the water and protected from the sun.